"So many favorite flavors and ingredients--pasta, tomato, Cheddar cheese, ground beef--are in this one easy skillet supper." Serve with baby carrots and Pepperidge Farm® Texas Toast. For dessert serve your favorite gelatin dessert. Thank you soooo much!! This was so quick & easy. I added onions & garlic to the browning meat! Awesome!! 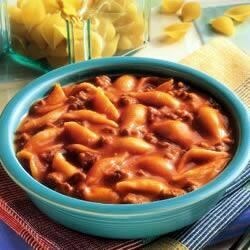 This is my all-time favorite comfort food...so delicious! eh, nothing special. My mom's goulash is much better and if I want something quick and easy I'll just purchase the hamburger helper version instead....cheddar cheese soup cost $2 by itself! Tasted good enough...but I don't think I'd make it again. This is even better if you sautee some onion and garlic and add a cup or so of shredded cheddar. I serve this with a good crusty bread.